No two tieflings look alike; the fiendish blood running through their veins manifests inconsistently, granting them an array of fiendish traits. One tiefling might appear as a human with small horns, a barbed tail, and oddly colored eyes, while another might manifest a mouth of fangs, tiny wings, and claws, and yet another might possess the perpetual smell of blood, foul incenses, and brimstone. Typically, these qualities hearken back in some way to the manner of fiend that spawned the tiefling’s bloodline, but even then the admixture of human and fiendish blood is rarely ruled by sane, mortal laws, and the vast flexibility it produces in tieflings is a thing of wonder, running the gamut from oddly beautiful to utterly terrible. Tieflings on the Material Plane rarely create their own settlements and holdings. Instead, they live on the fringes of the land where they were born or choose to settle. Most societies view tieflings as aberrations or curses, but in cultures where there are frequent interactions with summoned fiends, and especially where the worship of demons, devils, or other evil outsiders is legal or obligatory, tieflings might be much more populous and accepted, even cherished as blessings of their fiendish overlords. Tieflings seldom see another of their own kind, and thus they usually simply adopt the culture and mannerisms of their human parents. On other planes, tieflings form enclaves of their own kind. But often such enclaves are less than harmonious—the diversity of tiefling forms and philosophies is an inherent source of conflict between members of the race, and cliques and factions constantly form in an ever-shifting hierarchy where only the most opportunistic or devious gain advantage. Only those of common bloodlines or those who manage to divorce their worldview from the inherently selfish, devious, and evil nature of their birth manage to find true acceptance, camaraderie, and common ground among others of their kind. Tieflings face a significant amount of prejudice from most other races, who view them as fiend-spawn, seeds of evil, monsters, and lingering curses placed upon the world. Far too often, civilized races shun or marginalize them, while more monstrous ones simply fear and reject them unless forced or cowed into acceptance. But half-elves, half-orcs, fetchlings and—most oddly—aasimars tend to view them as kindred spirits who are too often rejected or who don’t fit into most societies by virtue of their birth. The widespread assumption that tieflings are innately evil—ill-founded though it may be—prevents many from easily fitting into most cultures on the Material Plane except in exceedingly cosmopolitan or planar-influenced nations. Despite their fiendish heritage and the insidious influence of prejudice, tieflings can be of any alignment. Many of them fall prey to the dark desires that haunt their psyches, and give in to the seduction of the whispering evil within, yet others steadfastly reject their origins and actively fight against evil lures and the negative assumptions they face from others by performing acts of good. Most, however, strive to simply find their own way in the world, though they tend to adopt a very amoral, neutral view when they do. Though many creatures just assume that tieflings worship devils and demons, their religious views are as varied as their physical forms. Individual tieflings worship all manner of deities, but they are just as likely to shun religion all together. Those who give in to the dark whispers that haunt the psyche of all tieflings serve all manner of powerful fiends. Tieflings rarely integrate into the mortal societies they call home. Drawn to the adventuring life as a method of escape, they hope to make a better life for themselves, to prove their freedom from their blood’s taint, or to punish a world that fears and rejects them. 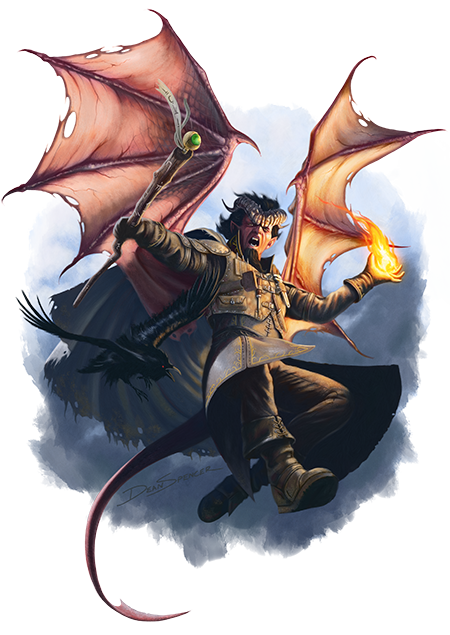 Tieflings make skilled rogues, powerful wizards and magi, and especially puissant sorcerers as their potent blood empowers them. Those who succumb to the evil within often become powerful clerics of fiendish powers. Tieflings share certain racial traits.